GET READY FOR THE BIG PICTURE! I’ve been hard at work since June, putting together an extremely provocative panel as part and parcel of all the terrific events surrounding Cape Farewell’s U-N-F-O-L-D exhibition at Museum of Contemporary Photography and Columbia’s Glass Curtain Gallery. The Big Picture: Art, Efficacy, and Climate Change will take place on Wednesday, April 20th, in the Film Row Center, 1104 S. Wabash, from 6:30pm-8:30pm. Please pencil it in your calendars. It’s not to be missed. “The Big Picture: Art, Efficacy, and Climate Change” (efficacy: capacity or power to produce a desired effect) to tease out these ideas in regard to contemporary art practice and climate change. 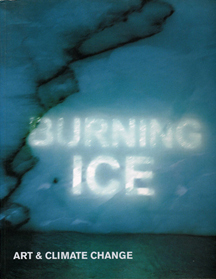 This panel will also examine why contemporary art has become such a critical hub that activates, educates, and elucidates, the complex issues of climate change, and how artists and scientists are in collaboration to address climate change. Diana Liverman: Co-Director of Institute of the Environment, U of Arizona, Tucson, Professor of Geography and Development, University of Arizona, visiting professor of Environmental Policy and Development, Oxford University, author of Climate Change: Risks, Challenges, Decisions among other articles, essays and books (http://www.environment.arizona.edu/diana-liverman). I was delighted to be invited to kick off Light Work’s great new blog Show Us Your Studio. Light Work, my absolute favorite artist-run organization, has been and continues to be, an artist-centered, community-based exhibition, educational facility and gallery. An Artist-run, non-profit photography and digital media center supporting artists since 1973, their quarterly publication Contact Sheet is now available online! Back issues are also all available from their website: http://www.lightwork.org. This is a wonderful opportunity to check out all the back issues that you missed. When you explore their chock full website (http://www.lightwork.org) don’t forget to browse through the artist archives which is hosts an astounding collection of 20th and 21st century photographic art. Under the enlightened Directorship of Hannah Friese, and of course the brilliant Jeff Hoone, who continues to be the guiding light as Executive Director of all the art organizations and galleries at Syracuse University, Light Work continues to stay the course…not just surviving, but thriving to maintain the longest run artist residency program in the world. They do this without editorial bias, chronicling an enormous range of photographic art, while honoring the artists, and enriching the photographic community-through their website, their collection, exhibitions, and publications. If there was an academy award for humanitarian and artistic contributions-no question they would be the first recipients! Judy Natal will visit the Light Work booth during Art Chicago, held this year April 29-May 2, 2011, to talk about her work and sign copies of Contact Sheet 126. 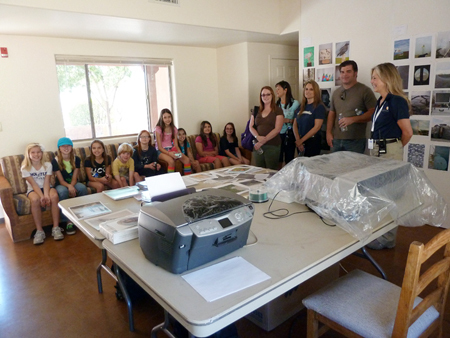 Stay tuned for more information on that event, and in the meantime, get to know Natal by reading this story about her experience running an Open Studio at Biosphere 2. 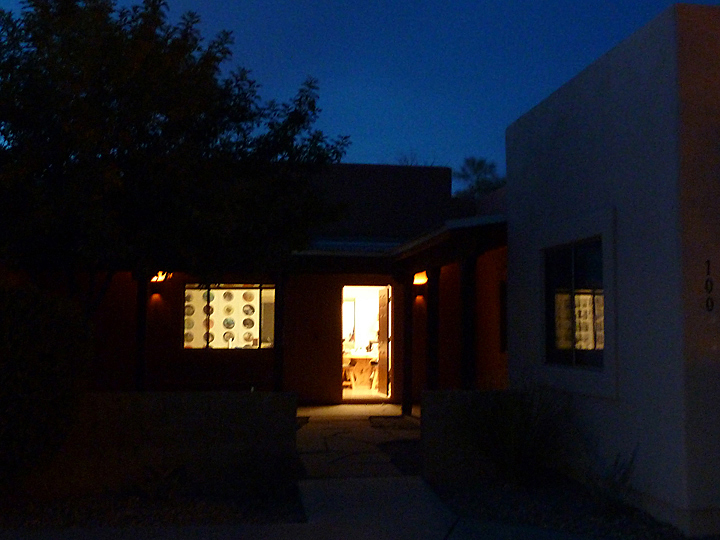 From November 1, 2010 to March 1, 2011, I created an Open Studio at the Biosphere 2 in Oracle, Arizona. I have been working at the Biosphere 2 on and off since I first set eyes on the place as a tourist taking a guided tour while attending a friend’s wedding in Tucson in June 2007. It was love at first sight! It is such a spectacularly peculiar place with a sordid past and a present and future of enormous promise where BIG science is now taking place, particularly around the issues of water. Which makes sense, when you consider that it is nestled in the beautiful Canyon del Oro, in the foothills of the Santa Catalina Mountains on the edge of the great Sonoran Desert. The Biospherians created Biosphere 2 to explore space colonization. It was an enormous engineering feat, with five ecosystems under 66,000 panes of glass, and eight humans (with all the accompanying psycho-drama) sealed within the airtight facility for two years between 1991-1993. (See Biospherian Jayne Poynter’s account in her book The Human Experiment. It’s a page turner!). 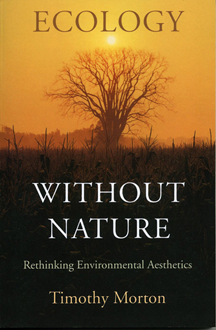 All the while, growing their own food, filtering their own waste and water, and orchestrating five ecosystems. At the time of my visit, I had begun what has now become a four-year project, Future Perfect, that entails a photographic sweep of three peculiarly evocative sites where human intervention and land use are exploring the quality and state of futurity, illuminating the present moment and the choices we have yet to make. 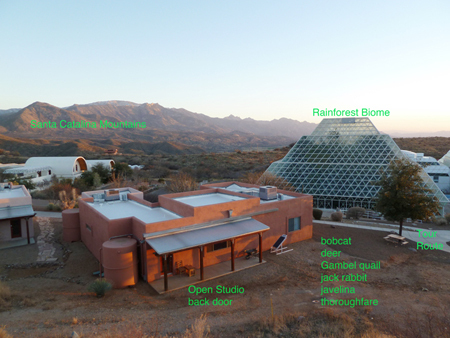 Immediately upon my return from visiting Tucson and Biosphere 2, I proposed an artist residency there, and I have been working with Biosphere 2 ever since in a mutually beneficial relationship, helping to establish a residency program in 2008. 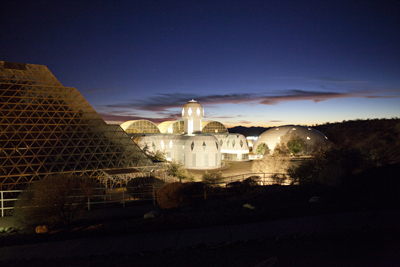 When I arrived at Biosphere 2 in November 2010, I knew my time was going to be different. 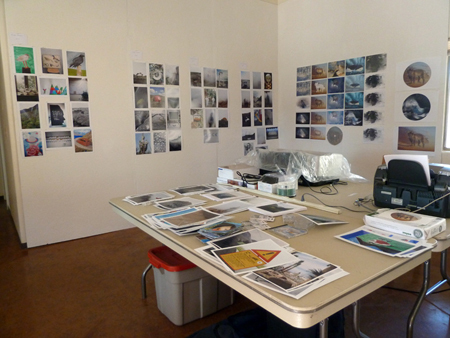 Unlike my previous residencies at Biosphere 2, when I was in the field photographing every minute possible, I now had the intention of setting up an Open Studio, with an expectation of proofing, printing, editing, and sequencing the hundreds of photographs that I had made to date, with the goal of printing the work for exhibition and publication. With this realization, I proposed opening up my art practice to the hundreds of visitors who come to Biosphere 2 seven days a week. The B2 Institute Director Pierre Meystre, who I developed and enjoyed a supportive relationship with (this is key! ), gave his enthusiastic support to my proposal, which placed a public face on the artist residency program. The interaction with the general public was enlightening and helped me hone my ability to speak about my new body of work. It also facilitated an ongoing dialogue about imagining the future, which was a primary goal for the project. Immediately upon my arrival, I ordered wallboards that the maintenance staff helped me paint and install in the casita where I stayed. 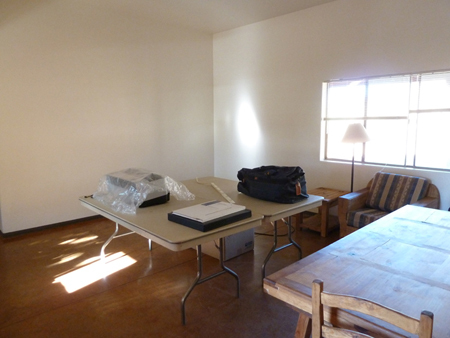 Within a day and a half of my arrival, the wallboards were up, prints were pinned to the wall, the two inkjet printers I brought with me were plugged in, the door was open (it’s winter in Arizona after all), and a sign welcoming Biosphere 2 visitors was up. The ensuing four months were a gift, a unique opportunity, and a challenge. I began a series of photographic portraits of people who visited the Open Studio, which included staff, students, tour guides, and visitors from every walk of life. Nobel laureate scientists, poets, artists, photographers, writers, grad and under grad students, faculty, research assistants, engineers, k-12 classes, the American Boys Choir (accompanied by a brief concert), even one of my own students from Columbia College visited. I also created a new body of work, now a limited edition portfolio of 35 prints, entitled Astral Projections, inspired by the writings of the renown biologist Edward O. Wilson, on the loss of biodiversity and animal extinction. 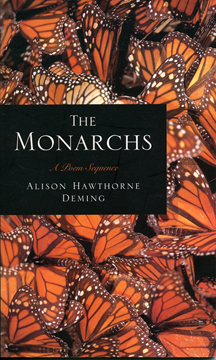 This work was playful and full of color, and it relieved the tedium of proofing and printing. Judy Natal was an Artist-in-Residence at Light Work in 2003, and her work was featured in an exhibition in the Light Work Main Gallery in 2004. Natal is a professor of photography at Columbia College in Chicago. Her work is the collection of institutions including the California Museum of Photography, Center for Creative Photography, and the Museum of Contemporary Photography, among many others. Her work has been exhibited at Projects International, The Nelson-Atkins Museum, and the Sao Paulo Biennial, among other venues. I am back in Chicago just in time, after presenting Future Perfect at the Society for Photographic Education’s National Conference in Atlanta, and from six months lecturing across the Southwest United States, four months of which was spent creating an Open Studio in an extended residence at the Biosphere 2 in Oracle, Arizona, to participate in the spectacular series of events featuring Cape Farewell’s traveling exhibition U-N-F-O-L-D at Columbia College Chicago’s Museum of Contemporary Photography and The Glass Curtain Gallery for an immersive experience into issues of art, advocacy and climate change. This is an unrivaled constellation of events with Columbia College Chicago setting the pace for a energetic and important site of dialogue around artists and scientists partnering to create a cultural response to climate change. The Big Picture: Art, Efficacy and Climate Change with panelists William Fox, Director of Art + Environment and explorer and author of many books including Terra Antarctica:Looking into the Emptiest Continent, and Aereality: Essays on the World; Timothy Morton, provocative author of Ecology Without Nature, and The Ecological Thought, professor of literature and the environment at University of California, Davis; Diana Liverman, Co-Director of the Institute of the Environment at the University of Arizona and reknowned climate change scientist; and Alison Hawthorne Deming, powerful poet, environmentalist, activist and author of The Edges of the Civilized World, and Monarchs among others. U-n-f-o-l-d leaves Europe and heads to the US, opening at the Colombia College Chicago on 16 March in the Museum of Contemporary Photography and the Glass Curtain Gallery. The exhibition runs until 23 April. Visit www.colum.edu/unfold for more information on the exhibition and special events, or download the programme below. A film by Peter Gilbert followed by Q&A with David Buckland and Chris Wainwright. At the Film Row Cinema, 1104 S. Wabash Avenue. 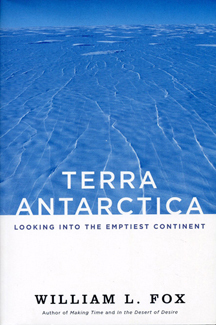 An introduction to Cape Farewell followed by a Panel Discussion featuring David Buckland, Carla Delfos, Steve Kapelke and Chris Wainwright. At the Conaway Center, 1104 S. Wabash Avenue. At the Museum of Contemporary Photography (600 S. Michigan Avenue) and Glass Curtain Gallery (1104 S. Wabash Avenue).